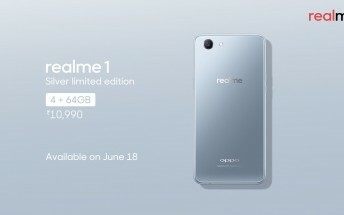 The Oppo Realme 1, which launched last month as an Amazon-exclusive in India, is getting a new color variant. The sub-brand's official Twitter account revealed a Limited Edition Silver model is set for launch next week. Introducing RealMe 1 Silver Limited Edition, your new stylish companion. Launching on June 18, 4+64GB at ₹10,990 with limited stock! The variant will come in 4GB/64GB memory configuration, and will carry a price tag of INR10,990, which currently translates into around $162. Sales begin June 18 onwards, which is less than a week from now.